The Heaven's Peak Fire Lookout in Glacier National Park is significant as one of a chain of manned fire lookout posts within the park. The one-story timber-construction structure with a flat roof was built in 1945. The flat, overhanging roof is anchored to the stone foundation with cables. The lookout was to be built in 1940 by local contractor Ole Norden as part of a Public Works Administration project. 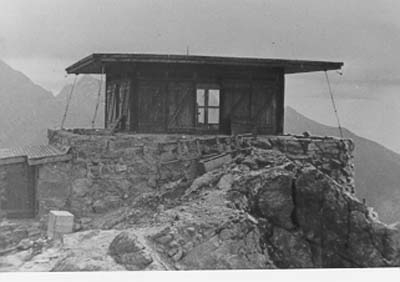 However, Norden was unable to perform the work, and the lookout was completed in 1945 under a different contract. Here's the our members favorite photos of "Historic Houses in Glacier National Park". Upload your photo of Heaven's Peak Fire Lookout!